The Annual Investment Meeting 2015 will attract many well-respected individuals. Their presence at the AIM Congress will benefit all who attend. Dubai has and always will be a city of great intrigue. In a few short years, this flourishing city has become the international destination for travel and business. The foresight of the Rulers of the United Arab Emirates has allowed one generation to see a city in the making and the building of cities within cities. Dubai and the UAE continues to thrive. 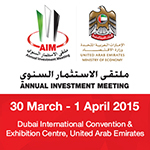 On 30th and 31st March and 1st April 2015, the Annual Investment Meeting 2015 (AIM) will be held in the centrally located Dubai International Convention & Exhibition Centre (DICEC), with ease of access to the Dubai International Airport (DXB) and the Al Maktoum International Airport (DWC), as well as Abu Dhabi International Airport. Abu Dhabi Airport is about one hour’s drive from the DICEC. As Dubai has become a central hub for travel there are many flights on a daily basis from all corners of the globe. The AIM Congress 2015 has attracted growing interest over the 5 years, providing an excellent and well recognised international platform for debate, deal making and professional education. Last year’s event saw participation and attendance with record numbers: 62% from the Middle East, 13% from Asia, 12% from Africa, 7% from Eastern Europe, 4% from Western Europe and 2% from the Americas. Press Release on 22 February 2015. In the meantime, if you have any queries regarding this event please contact the AIM Congress team.